Located in the Heart of Hilo. Come and enjoy. Close to everything, The room features a queen bed with crisp sheets. 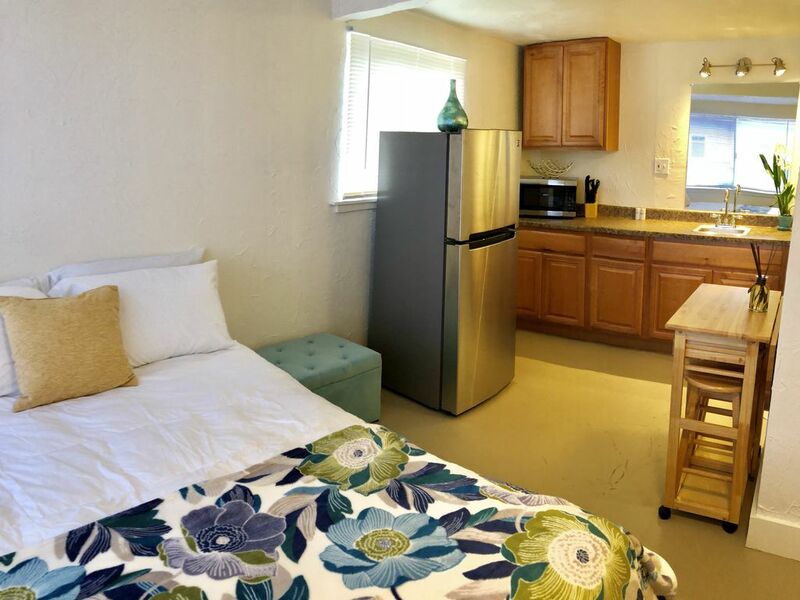 This Studio makes a perfect spot for a couple or travel buddies, There is a bathroom with shower, kitchenette with hot plate, toaster, coffee pot, microwave, refrigerator, washer & dryer. The unit also comes with a 32” flat wall mounted Roku smart TV and cold AC. Just what your looking for in a clean, comfortable, quite place to stay. The room also has a private bath. Perfect location as a home base if you want to explore the whole island. Please turn off when you are not home. Very Nice Unit, Great Location ! Walking distance to downtown Hilo. Close to bus stop if you want to go to shopping mall and / or Volcano National Park. Contact person was very helpful with quick response times. Hilo Hideaway is a perfect place to stay in Hilo for one or two. I travel for business and love this VRBO. It has everything I need and more. We were visiting Big Island from Oahu, spending a few days in Hilo and then a few in Kona. We were traveling with our little fur baby (toy poodle) and this place was dog friendly which was perfect for us. The unit had everything you need for a visit to Hilo. It is a studio so perfect for singles or couples. The nice touch was a dedicated parking spot! It is close to everything in Hilo town and just a short drive to local attractions. This was a great spot for my business trip. Small spot but not bad for 1-2 people. Host was easy to communicate with. Heart of Hilo has everything a person needs. It was perfect for my situation. Heart of Hilo is clean and well equipped. Kitchenet is perfectly stocked and access to a washer and dryer outside the door is wonderful. The location is close to town making access easy. Parking is assigned and is very convenient. As a single traveler this accommodation was perfect. im glad you enjoyed the spot. Thanks for keeping the place in great condition. Come again. Great location and nice neighbors. clean and everything you need. Thanks for taking good care of the place. Come again.